Winter Solstice is nearly here (December 21), and for those of us who are not so into the religious holidays, solstice is a great excuse to celebrate the passing year and the promise of more light. 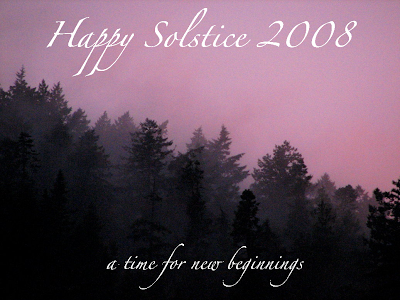 Being the longest night of the year, solstice also symbolizes mystery and the descent into darkness. With the sun at its lowest point, it is a reminder that we must first pass through the darkest night to find the light again. This has been a long difficult year for many, and my heartfelt wishes go out to all who have struggled, lost loved ones, and suffered illnesses. Thanks for looking, reading, and simply for giving me the time of day. I am always delighted when I get a note from somebody letting me know they have read my blog. I know how busy our lives can be, and I truly appreciate your attention. Please pay a visit to my store and be sure to check back later. The image at the top of the blog is my first store item. I took this photograph at Cornet Bay, Washington during a glowing, misty sunset. Steve has a cafe press store too. See his cool stuff here. Sky, I would just like to add that the solstice is a holy time in the worlds oldest known religiions, which revered the earth as mother and sacred. Most of our modern "holidays" evolved around these ancient ones, and anyone who feels a reverence for our planetary mother, or Gaia, would do well to mark their passing. Thanks for the reminder. Ah, yes. Thanks Thomas. And holy sun (sol) too. It is all about the relationship of these two. And I wish a happy summer solstice to those in the southern hemi! I can't wait to come down and have two summer solstices in one year. That will be something! Going to hop on over to Cafe Press here in a bit.